For a lot of us folks who are either thru-hiking or destination hiking, the pack we carry with us is large and in charge, which is to say full of all of the gear we need for the entire trip. These high-volume, structured packs are ideal for journeys like that, but they’re not necessarily the pack we want to take with us once we make camp and decide to go off and do a little exploring. What we need is something small, yet substantial enough to be used on its own with the ability to keep our essentials at the ready. But who the heck wants to carry a second pack with them? Ain’t nobody got room for that! A while back, pack manufacturers began making the lids on their higher volume packs removable, with a waist belt so they could be converted to a fanny pack. More recently, some of these manufacturers have even made the large front pouch on their packs completely removable, giving you the ability to unzip or unclip it from the from the main pack, revealing a lightweight, low volume ruck sack in the process. The common fault of both of these options is that they are generally unstructured and lack any organizational features so they’re not great for carrying a large load or for ease of access. That being said, here are some alternatives pieces of gear that can fill this role nicely. One uses a reliable, time-tested design; another is totally outside of the norm, while a third serves as a prime example of forward thinking. These options are designed to work individually on their own or in conjunction with one another as a system. All three allow you easy access to your essentials, even when you’re on the move, and when used together disperse the weight of your gear across your body. Additionally, pairing any of the following with a standard daypack (1600-2200 cubic inches), may just allow you to eliminate the need of a higher volume multi-day pack altogether. A modern and expanded take on the classic “fanny pack”, the Mountainsmith Day lumbar bag offers 854 cubic inches of storage, dual water bottle pockets and multiple lashing points. The bulk of the volume is in the main pouch which also has a small electronics pockets. Additionally there is a smaller front pouch for other gadgets, maps, a multitools, and so on. The whole thing is made from heavy duty Cordura – which I DWR because I know I’ll be out in the elements with it. When paired with the Mountainsmith Strappettes, you essentially transform the Day into a back pack that sits on the small of your back that you can easily lash a tent and sleeping bag to – or leaves room for a day pack. Note: Prior to acquiring the Day for testing, I carried the 1100 cubic inch Cairn lumbar bag that Mountainsmith released for seemingly a single season back in 2002. I still use it and it is still in tip top shape after 14 years of hiking, summiting, going to college, and traveling all over the world. That’s a sure sign of quality materials and craftsmanship. Coming in under 90 cubic inches, the Hill People Gear Recon Kit Bag clips around your chest by a minimal harness which allows you to still wear a back pack. I generally pair it with something like the aforementioned Mountainsmith Day or a Camelbak M.U.L.E.. 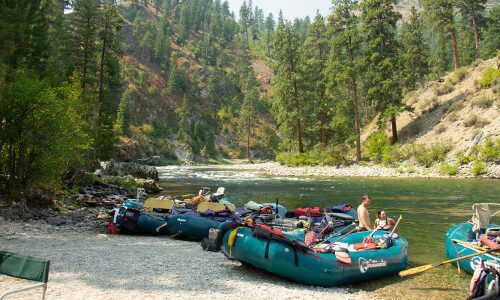 I found it particularly effective while fishing when I could leave my main pack on my back or on shore, and wade into the water with all of my essentials right in front of me. While hiking I generally store maps, small tools, and a headlamp in mine, although I have used it to carry quite a bit more. This particular version has MOLLE webbing across the front of it so you can lash additional pouches or other pieces of gear to it. Note: Hill People Gear actually has a pretty sweet system for runners too. Check it out here. Made from 22oz twill, 15oz tin cloth, and bridle leather, the Filson Tool Belt Pouch is just as nice to look at as it is to use. Handmade in the USA, this ultra-durable pouch features two large, stow pockets and two smaller pockets. One of the larger pockets features a track of tool loops which I use to carry everything from pliers to food utensils to a Sharpie and spare knife. It also has two external tool loops that are perfect for carrying a small hatchet and hammer. I originally bought this tool belt pouch for working on my property in Vermont but became accustomed to wearing it while hiking the acreage as well. Now I use it for work when I’m visiting the place or as my unconventional “go to” pouch for short trips out in the wild. 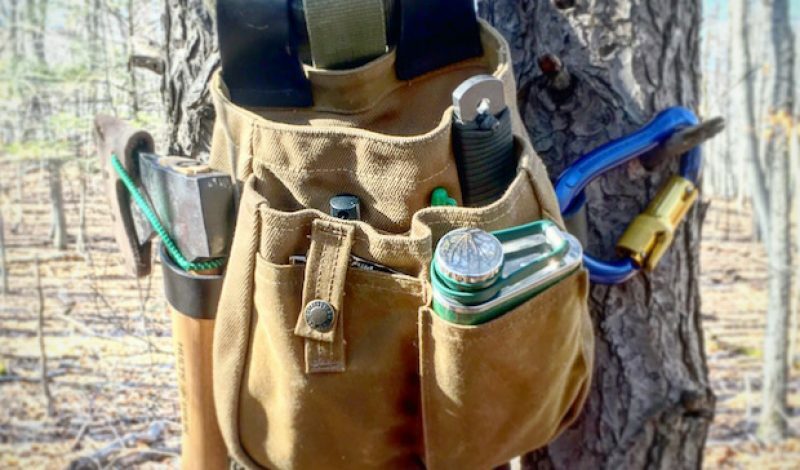 Note: Though it’s not something someone would usual consider for hiking and camping, this tool belt pouch is the most unobtrusive and most effective scouting pack I employ on my adventures – I would encourage anyone to try the concept out. Due to the fact that these last three products are worn on different parts of your body, they can work in conjunction with one another or with a day pack. If you’re the type of person who packs lite and filters water on the trail, you may be able to extend the use of something like this even further. Either way, the benefit of employing a set up such as this one is that it creates an organized, modular system that can be added and subtracted from and allow you to essentially carry everything you need for a long term journey. Another benefit of a system like this is that it allows you to disperse the weight of your stuff across your various parts of your body – including your chest and lumbar area i– nstead of covering your back and putting excess strain on your shoulders and hips. After taking six months off from trekking to recover from having my knee rebuilt, I found that I ultimately wasn’t comfortable in my multi-day pack when doing some prep runs for a larger trip. Thinking outside of the box, I eventually pieced together the Mountainsmith Cairn, HPG Recon Kit Bag, and Filson Tool Belt Pouch and I haven’t looked back since. I found that the modularity and dispersal of weight that this system provided allowed me to carry everything I needed for extended trips without feeling the effects of one leg that was considerably weaker than the other or the fact that my stamina had been greatly impacted by being a lump on a log for so long. I totally wrote that last line just for my mom. She says stuff like “lump on a log”.